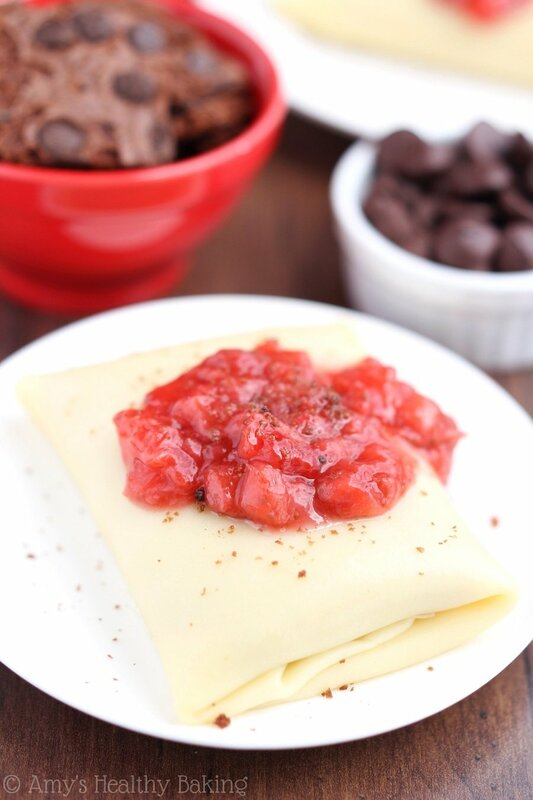 Classic crêpes wrapped around a decadent chocolate cream cheese filling and topped with fresh strawberry compote. Easy, healthy & so satisfying! The summer before I left for college, my parents purchased a family membership to the local country club. They opted for the most basic package, mainly for access to the pool, so that my mom wouldn’t need to build and clean one in our backyard to fit in her daily laps. Plus their location up in the hills was much less crowded with rambunctious kids than the city’s popular swim center! As a close second to the quiet solitude of the peaceful pool, our entire family adored the country club’s brunches. Held on the last Sunday of each month, along with holidays like Easter and Mother’s Day, the staff set up a long table in their spacious dining hall that threatened to collapse under the weight of the gourmet food. The buffet began with at least three different salads and juicy freshly sliced fruit, followed by a platter of bagels, croissants, and practically every pastry under the sun. After the build-your-own salad toppings and bowl of shrimp, the table ended with a wide array of hot food in warmed covered serving trays. They always offered typical continental breakfast dishes, like scrambled eggs, sausage, hash browns, and applewood-smoked bacon, along with more interesting selections such as Eggs Benedict, chicken parmesan, and grilled fish over roasted bell peppers. My mom and brother always made a beeline for the sweeter sides that alternated between pancakes, waffles, and French toast, but we could always count on a big tray of blueberry blintzes! On our last visit, I served myself the customary blintz, then paused to peek at the dessert table. As I stared at the miniature fruit tarts and petite chocolate cakes, I started to wonder if I could create my own recipe, combining those two sweet treats with my coveted blintz. 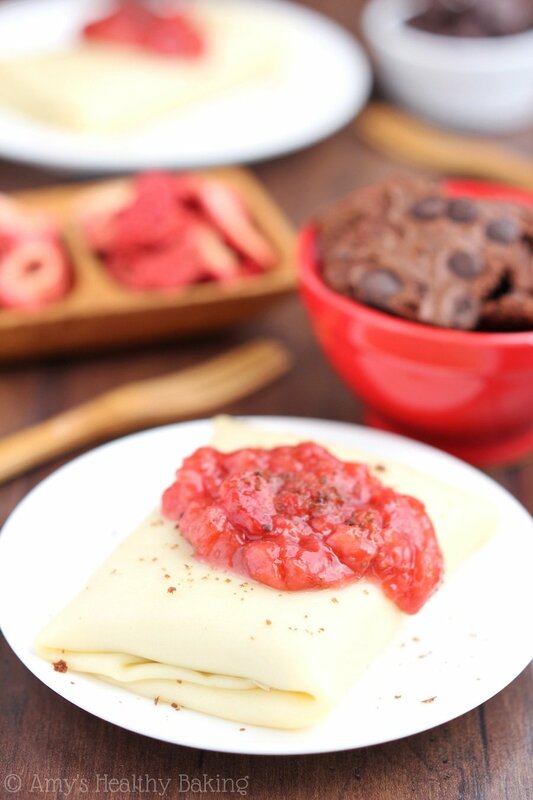 And so these Strawberry & Chocolate Brownie Brittle™ Blintzes were born! Stuffed with a decadent chocolate cream cheese filling and topped with fresh strawberry syrup, these thin pancakes look so sophisticated at your brunch table, but they’re supremely easy to make. 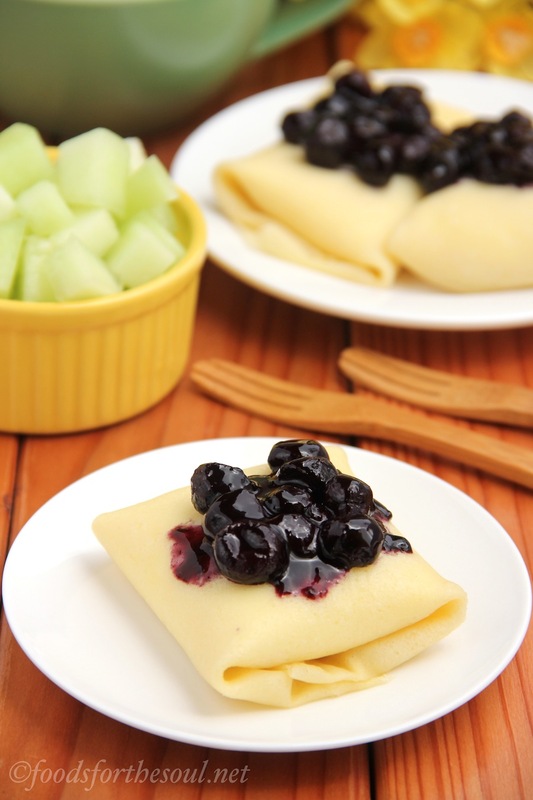 Despite their indulgent taste, these blintzes are actually low fat, low calorie, and practically guilt-free! 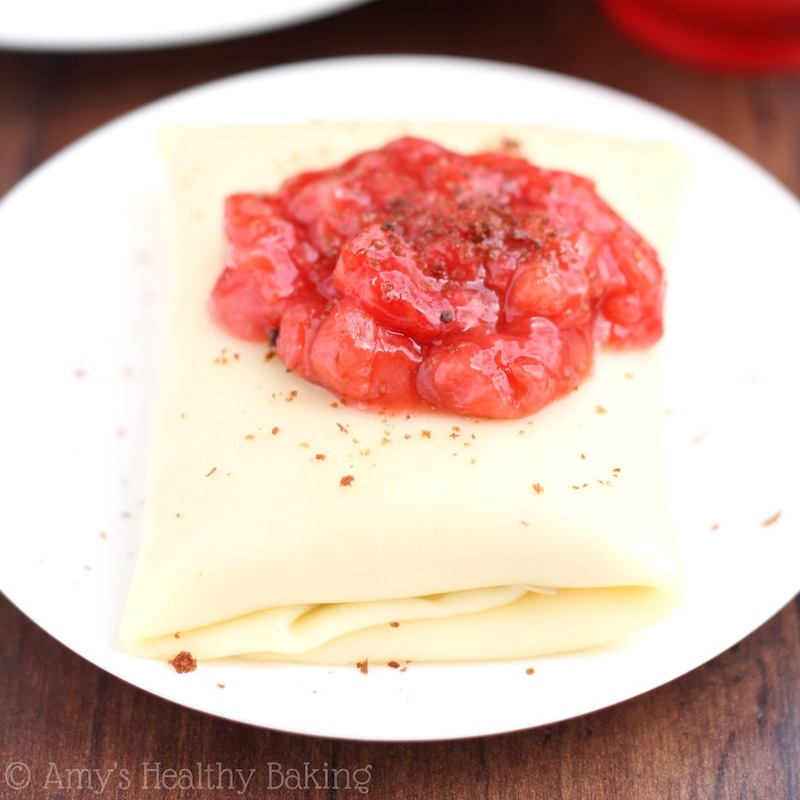 Although some people characterize blintzes as a dessert item, they’ve always been a breakfast food to me. If it’s acceptable to smear cream cheese across a bagel for your morning meal, then why not roll it up inside of a thin pancake? Today’s recipe contains three components, but because they’re all incredibly easy to assemble, don’t be frightened by the longer ingredient list! You can even prepare the filling and fruit topping up to 3 days in advance, and the crêpes up to 2 days early, which makes your weekend brunch a breeze to toss together with a quick 2-minute assembly. The filling comes together really quickly too! Just beat cream cheese, Greek yogurt (for extra protein! ), cocoa powder, and sweetener in a medium bowl before folding in my secret ingredient… Brownie Brittle! Sheila G, the creator of this sweet treat, loved the crispy outer edges of brownies and figured out a way to basically turn that into bark. Her Brownie Brittle has a crispy cookie-like texture, with the flavor of brownies, and is studded with chocolate chips. It’s absolutely addictive, and I can easily munch my way through a big bag in less than a day! Although crêpes may look and sound difficult to make, if you can twist your wrist in a circle, you’re going to be a pro! After mixing together the batter and letting it rest, grab a large dinner plate, plenty of paper towels, and preheat a large 8” skillet coated with cooking spray over low heat. While you only need about ¼ cup of batter per crêpe, use a ⅓ measuring cup instead. This larger size won’t be filled to the brim, which lessens the chance of spilling, and since a little bit of the batter sticks to the sides, this also ensures you’ll still have enough to pour into the pan. Before pouring, pick up the pan with your other hand. While tilting the measuring cup to add the batter, start rotating your wrist in a circle. The faster you spin, the more even the surface of your crêpe will be! Keep twirling your wrist until the batter covers the base of the pan and looks somewhat like a circle. 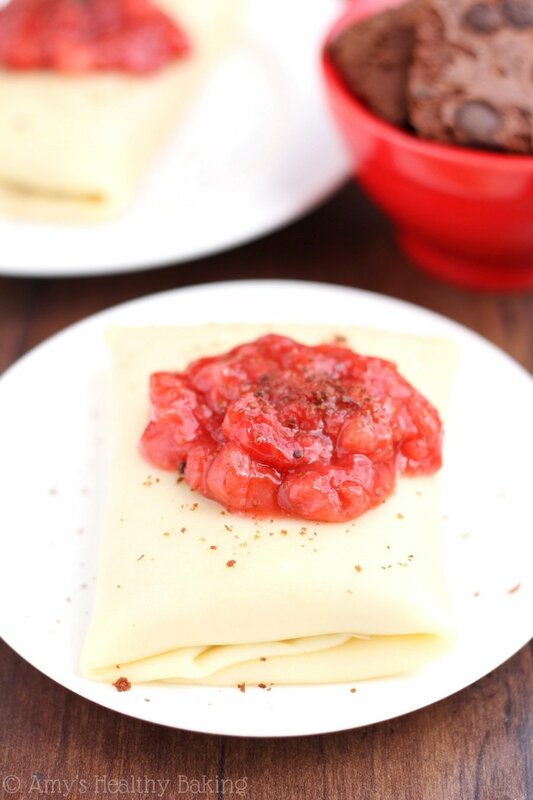 It doesn’t have to be perfect: we’ll fold up the blintzes like a burrito, so no one will ever see the uneven edges! Let the pan sit until the crêpe looks cooked all the way through with no wet spots, then flip out onto the dinner plate and top with a paper towel. This helps prevents the crêpes from sticking to each other. Now recoat your pan with cooking spray, and start twisting your wrist again! To assemble, flip over one of the crêpes so that its bottom surface (what originally touched the pan) is pointed upward. Spoon a scant ¼ cup of filling into the center of the pancake in a rectangular shape; fold in the short ends first, followed by the long ends; then flip over to hide the seams. Top with the strawberry sauce and grab a fork! 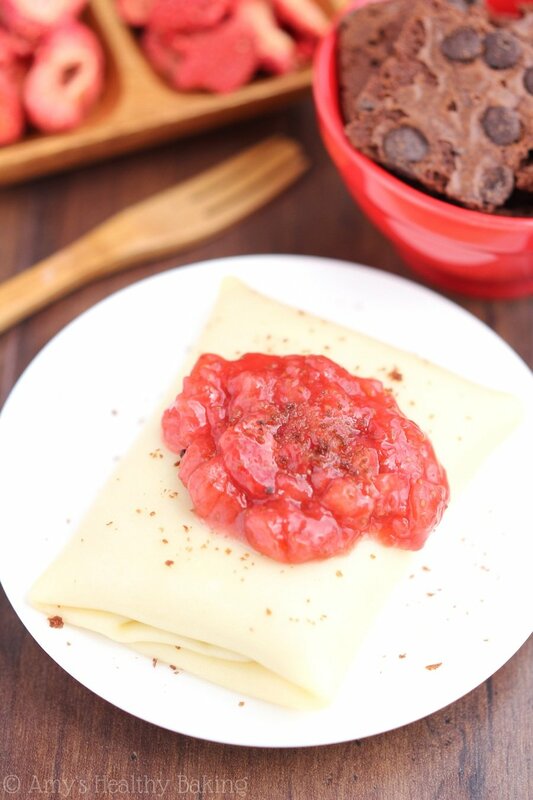 With their juicy berry syrup and rich chocolaty filling, these healthy Strawberry & Chocolate Brownie Brittle™ Blintzes will easily disappear in mere seconds after you serve them! The sweet Brownie Brittle inside tastes like a real breakfast treat, and your hungry diners’ eyes will light up at the decadent surprise. 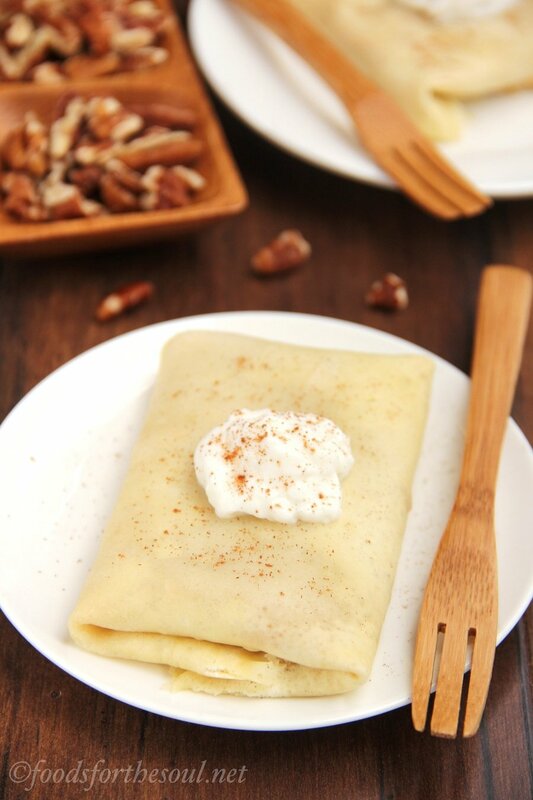 The blintzes’ sophisticated flavors are perfect for Father’s Day, special weekend brunches, or just curbing any chocolate breakfast cravings. 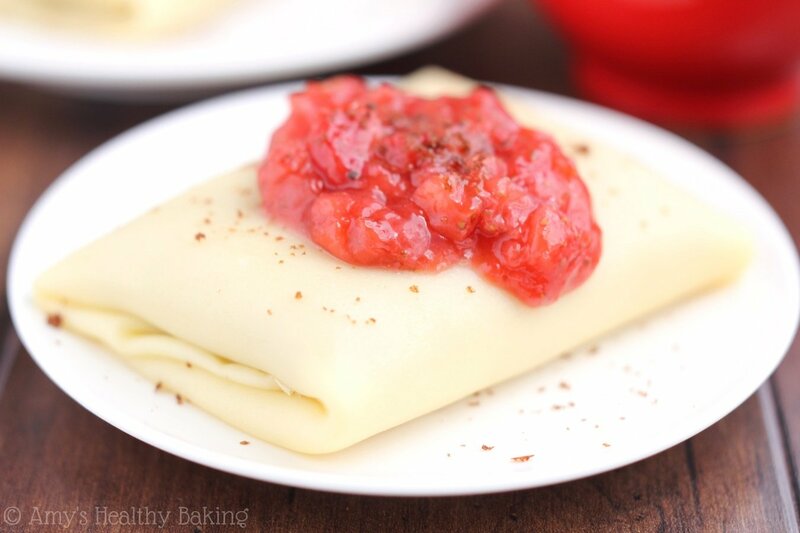 These blintzes are a true breakfast treat! With their decadent chocolaty cream cheese filling and sweet berry compote, they taste like dessert—but are secretly healthy. You can prepare the topping and filling up to 3 days in advance, and the crêpes up to 2 days early, making this special breakfast so easy to assemble and serve! To prepare the sauce, combine the blueberries, cornstarch, and water in a small pot. Gently stir with a spatula until the cornstarch dissolves. Bring to a boil over medium-low heat, stirring frequently, and boil for 3-5 minutes until the liquid turns clear and reduces by about half. Remove from the heat and allow it to cool slightly. To prepare the crêpes, lightly beat the egg and egg white in a medium bowl. Whisk in the milk. Whisk in the sugar and vanilla. Add the flour, whisking just until frothy. Let the batter rest while preparing the filling. To prepare the filling, beat the cream cheese, yogurt, cocoa powder, and Stevia in a medium bowl until smooth. Gently fold in the Brownie Brittle. Cover and chill until ready to assemble the blintzes. Preheat a large 8” pan over low heat, and lightly coat with nonstick cooking spray. When the pan is warm, scoop about ¼ cup of batter using a 1/3 measuring cup, quickly add it to the center of the pan, and pick up the pan to swirl the batter around to completely cover the bottom. Place the pan back down on the burner. Let the crêpe sit until the batter looks fully cooked. Loosen the edges using a spatula, and remove onto a plate. Re-coat the pan with cooking spray, and repeat with the remaining batter, placing a paper towel in between each crêpe to avoid sticking. To assemble, flip over one of the crêpes so that the bottom that was touching the pan is facing upwards. Spoon a scant ¼ cup of filling into the center in a rectangular shape. Fold in the two shorter edges, followed by the two longer edges. Flip over so that the seams are touching the plate, and top with 1-2 tablespoons of the strawberries. Repeat with the remaining crêpes, filling, and topping. Note: Store any leftover topping or filling in an airtight container in the refrigerator for up to a week. For the crêpes, place the individual crêpes in between sheets of wax paper in a large zip-topped bag, and store in the refrigerator for up to 3 days, or the freezer for up to 3 months. *Disclaimer: This post was sponsored by Brownie Brittle™. All text, images, and recipe are my own. These look SO good! I miss buffets. We used to go all the time when I was a kid. Some day I want to go to the Thunder Valley one. That has to be on a day where I don’t eat anything else, ha! These look incredible Amy thank you!! 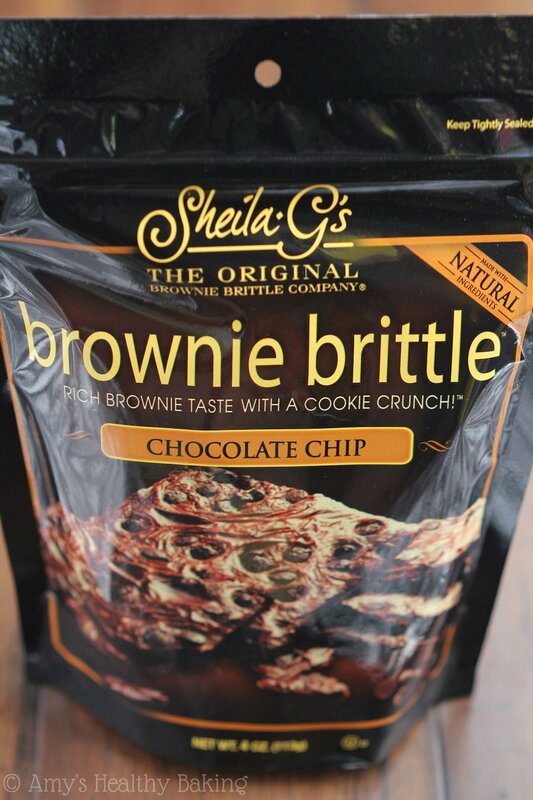 🙂 What do you recommend as a substitute if we don’t have the Brownie Brittle? 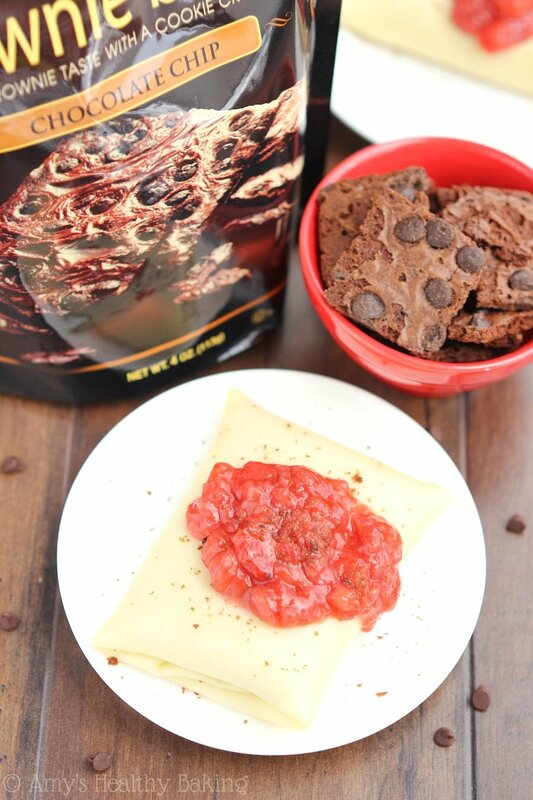 I love how you combined two of your favorites into a yummy treat! So smart! 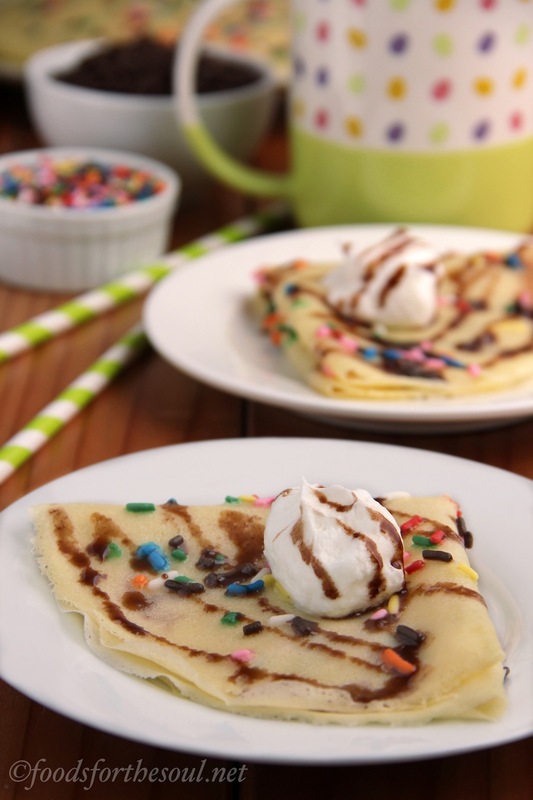 I’ve seen that brownie brittle … I bet it’s awesome in these blintzes! Maybe you should recommend them being served at the next brunch?? I’m sure they would be a huge hit! Thanks Gretchen! 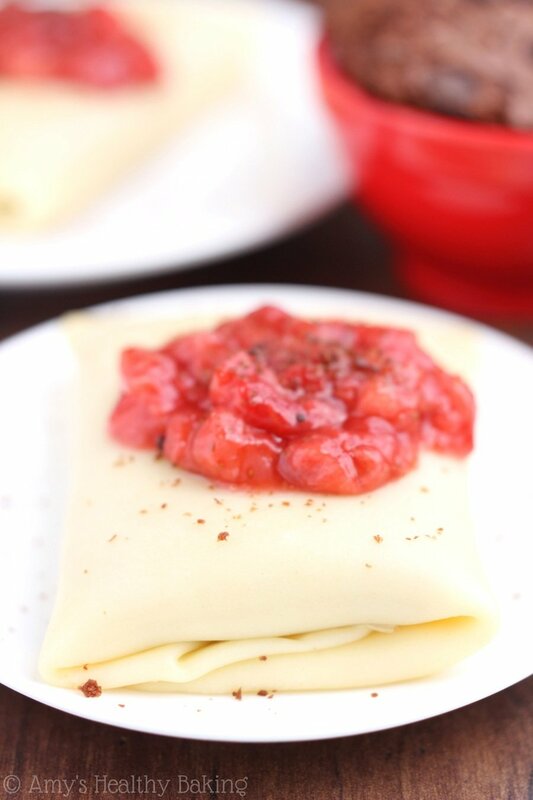 I’d love it if they changed the blintz flavor for the next brunch, especially if it had strawberries and chocolate involved… 😉 And that’s so cute that your mom used to order blintzes! I didn’t know what they were either until my mom explained it to me — too funny! I think of blintzes as breakfast food, too, but dessert for breakfast in my book is always ok. I’ve been wondering about the brownie brittle. It looks so addictive, and seems like a great addition to any dessert (or breakfast)! Dessert for breakfast is one of my favorite meals; I always love sneaking in extra sweets to my day! 😉 The Brownie Brittle tastes similar to Oreos, just more of a lighter/milkier chocolate flavor. So if you like Oreos, I think you’ll love the Brownie Brittle too!